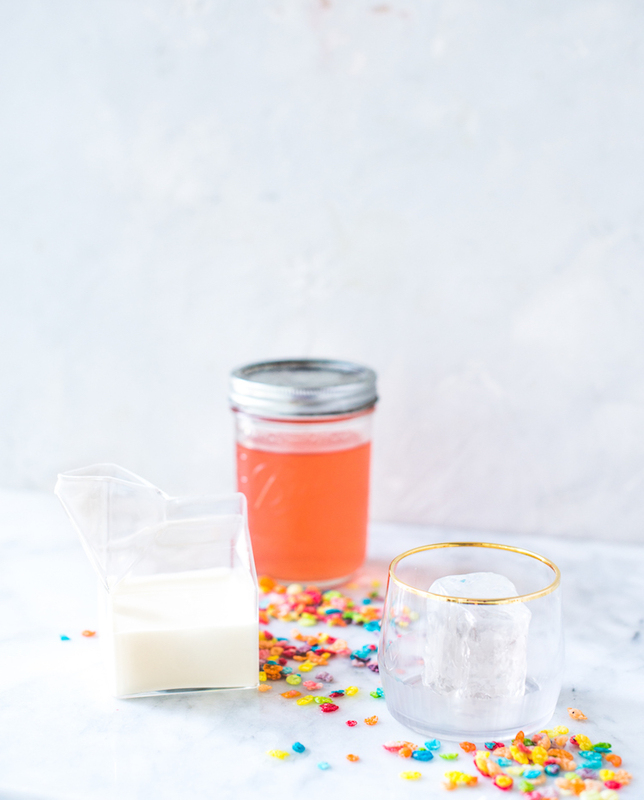 I recently made Clarified Milk Punch to try this by gone method of preserving drinks and I am now smitten with making (and drinking!) them. 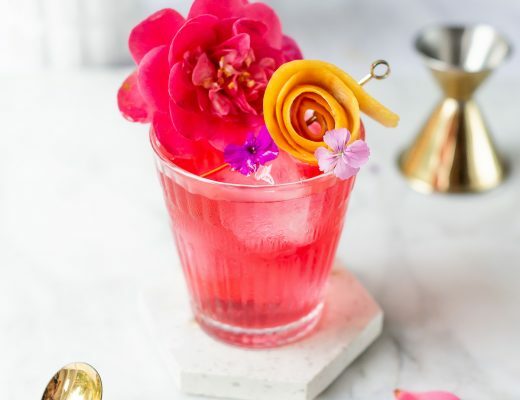 You can clarify just about any cocktail that has an acidic component like citrus in it. So I figured why not try my hand at clarifying some other drinks. 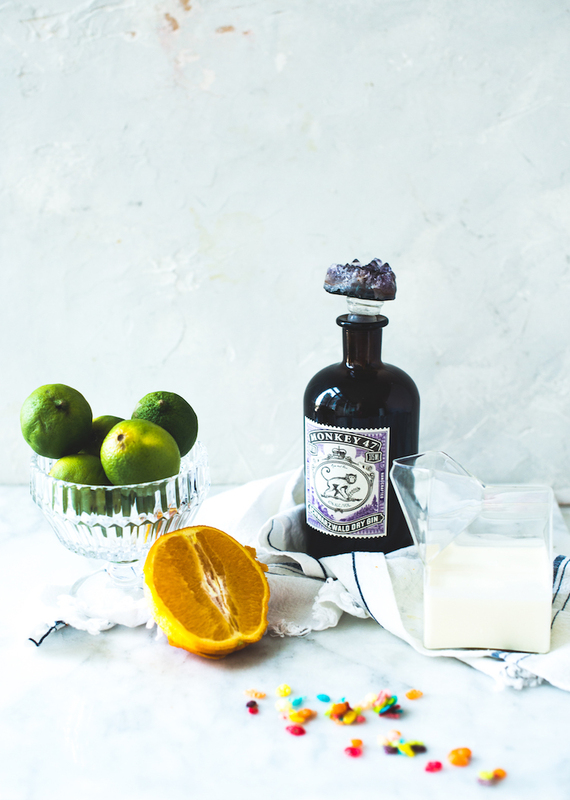 It may sound complicated, but it is so easy to mix these drinks up. 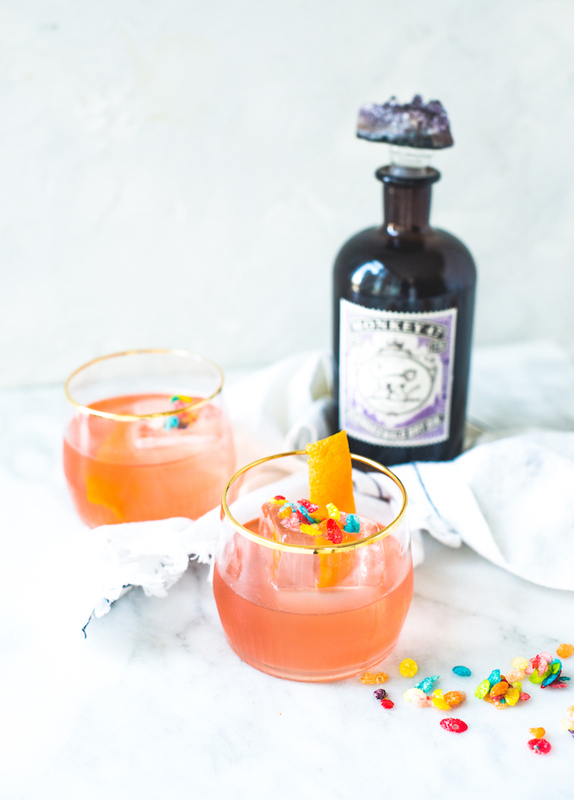 And the best part, you can make big batches and they last for awhile in the fridge, a cocktail ready in two shakes of a lambs tail! I turned 30 today (cue the record scratching!) 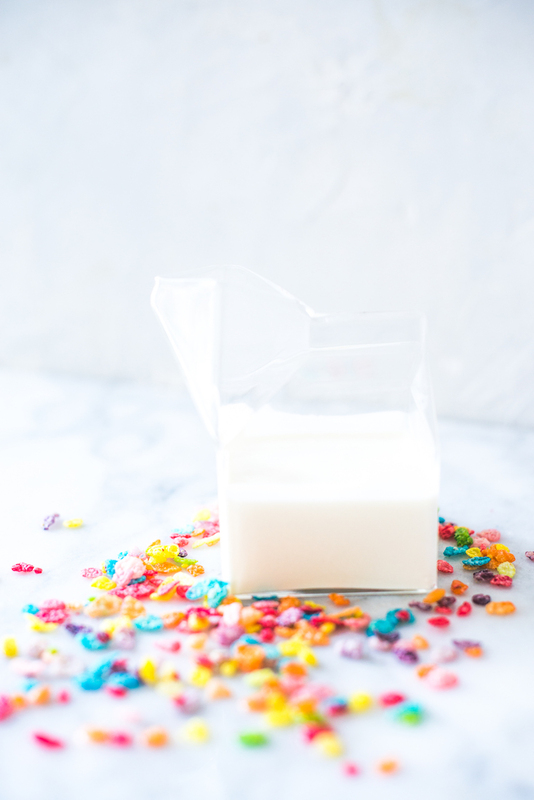 so wanted to make a drink that made me feel like a kid again and what better thing to make you feel like a kid than cereal! A bowl of Fruity Pebbles is still an irresistible guilty pleasure for me. 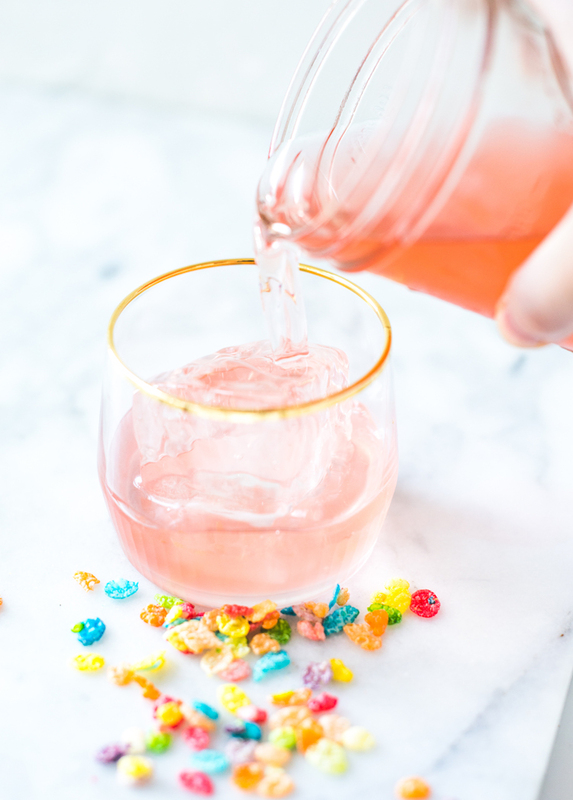 I knew I had to add this colorful, saccharine cereal into a drink somehow. 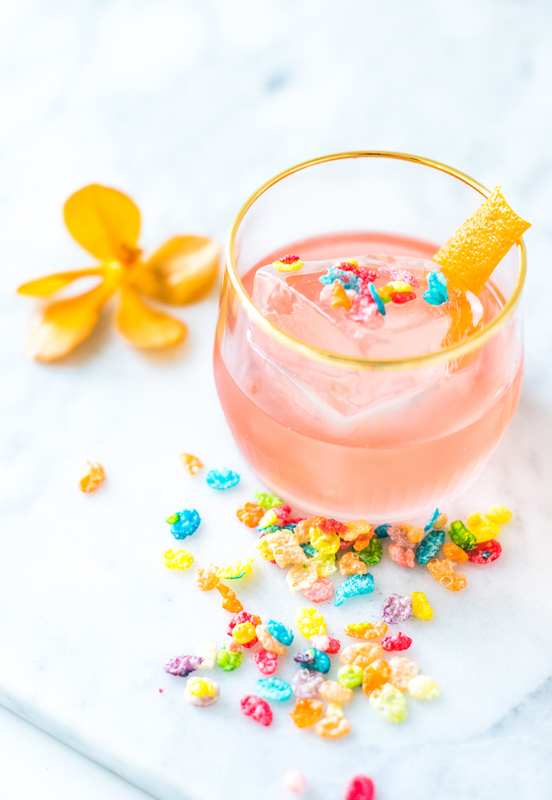 And that is how the Fruity Pebbles Clarified Milk Punch was born. Speaking of born…I have been letting all the great memories & amazing experiences I’ve had the past 3 decades soak in before the inevitable existential crisis sets in. 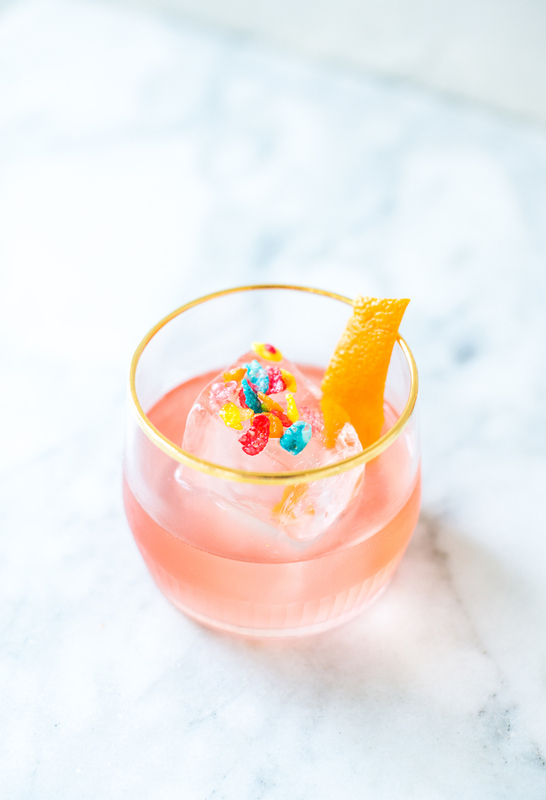 Good thing I made a big batch of this clarified cereal cocktail, I am going to need it! I used the flavor “notes” (ha!) 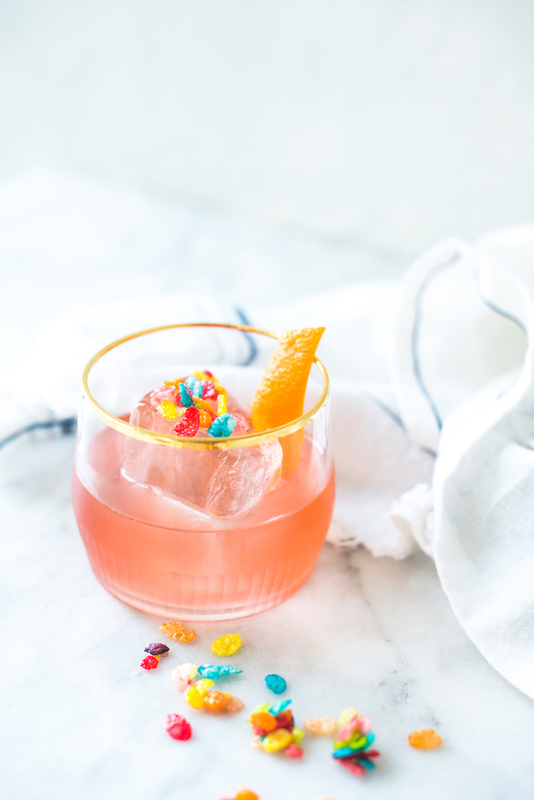 of Fruity Pebbles for the supporting cast of citrus like lemon, lime and orange. Although I don’t get any pineapple flavor, I decided to add this in for a tropical twist. 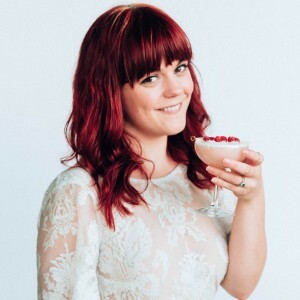 My last clarified cocktail also had pineapple and I love how the milk wash rounded it out in the finished cocktail. 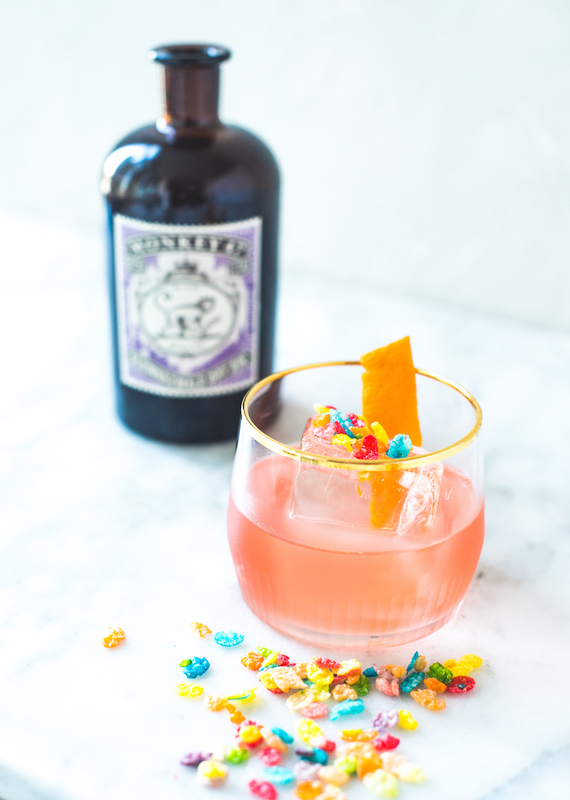 As for the base spirit, it was a no brainer to to use Monkey 47 gin! It’s one of my all time favorites. 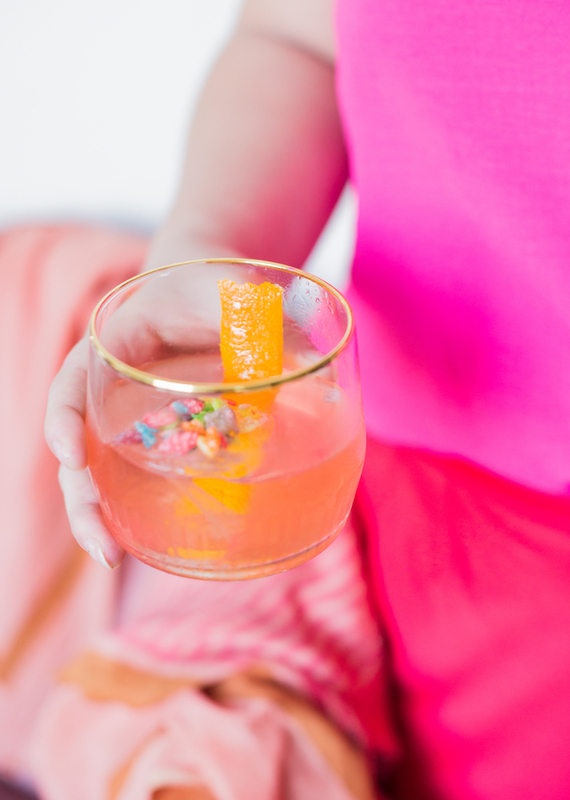 It has fragrant citrus on the nose from the hand peeled grapefruit and orange while the lemongrass, lingonberry and floral notes pop on the palate which go great paired with Fruity Pebbles. 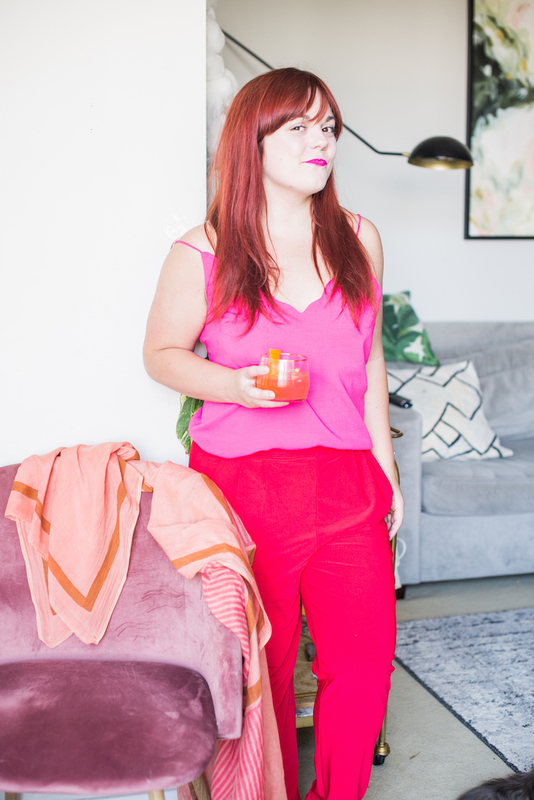 High brow, low brow combos are some of the best (hello fried chicken and champagne!) 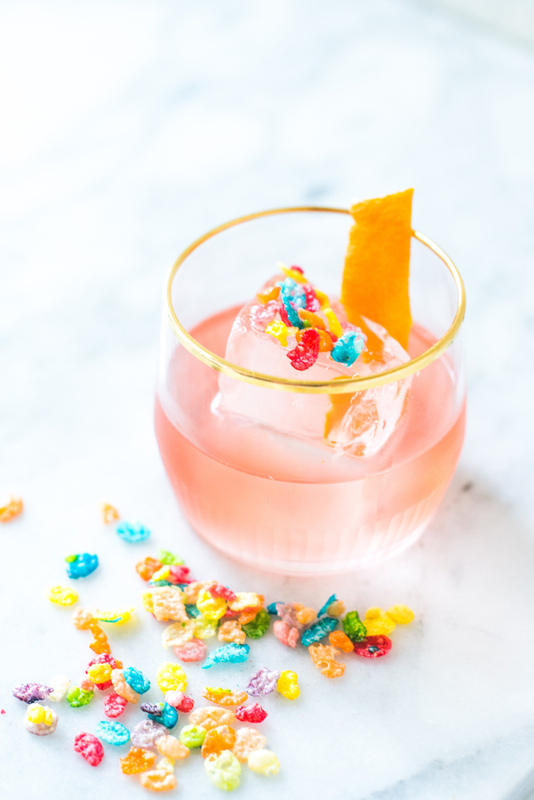 This Fruity Pebbles Clarified Milk Punch is one of my favorite drinks I have ever made. There, I said it! I chose a favorite child and I am not sorry. Add sugar, water, lemon juice, lime juice, pineapple juice, and gin to a large bowl and stir to dissolve the sugar. Muddle the strawberries in the bowl. 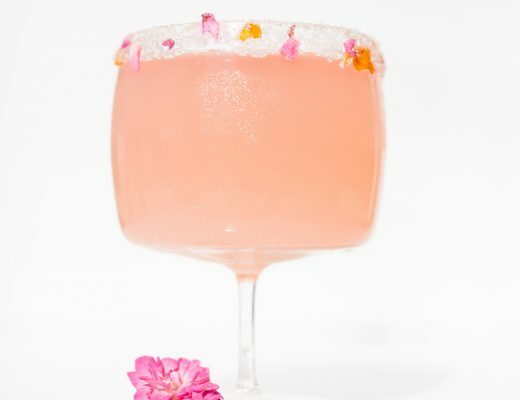 Strain the cocktail into a container. In a non-reactive container, add the cold milk. Slowly pour in the cocktail into the milk. Stir. Let set for a few hours to let the milk do its thing (a.k.a. curdle) do not stir. When the wheys have formed into a “web” in the container and settle to the bottom, it’s time to strain. Put a coffee filter or cheese cloth over a container or jar with a funnel. I used a Chemex coffee maker. Slowly strain into the filter. It will take a bit to fully strain. Store in a mason jar or large sealed container for up to a few months. 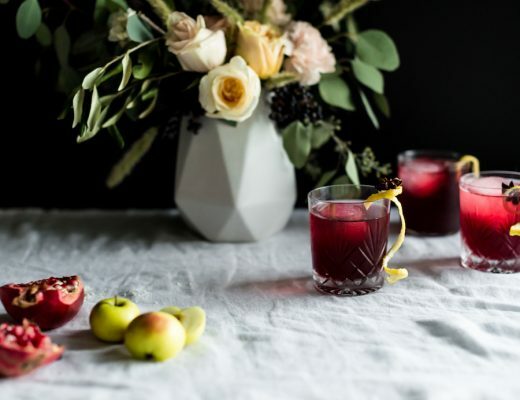 To serve: Pour into a glass with a large cube, preferably clear ice to show off all your hard work clarifying. Express orange peel over the glass and drop in. 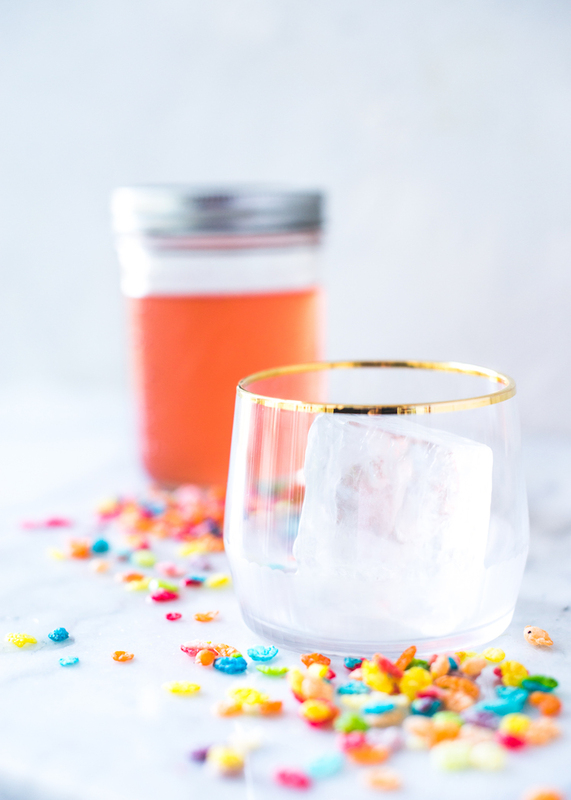 Sprinkle Fruity Pebbles onto the ice and take you first sip and feel like a kid again! Add mills and cereal into a jar and shake. Infuse for 1-2 hours. Fine strain into the container you’ll be adding your punch to or a jar for later use. Store for up to 4 days.